Sandy to peaty shores, lakes and ponds, bog pools; thriving (fruiting) on recently exposed shores. The three angles of the culms may not be clearly seen in pressed specimens, which may nevertheless be identified by the combination of spikes scarcely thicker than the culm and the relatively slender culm. 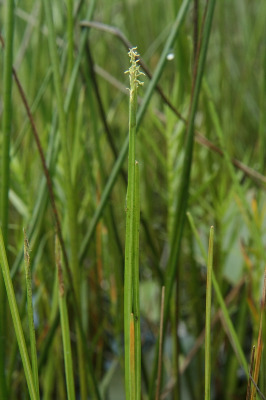 Numerous limp, hair-like culms are produced when the plant is growing in water; these are contrasted with the similar structures of Eleocharis acicularis, Juncus militaris, and Schoenoplectus subterminalis, with which this species may grow, in couplets 26–28 of Key A, to aquatic plants with all leaves floating or submersed. MICHIGAN FLORA ONLINE. A. A. Reznicek, E. G. Voss, & B. S. Walters. February 2011. University of Michigan. Web. April 20, 2019. https://michiganflora.net/species.aspx?id=1120.